Final Fantasy Tactics is set in a fictional medieval-inspired kingdom called Ivalice, created by Yasumi Matsuno. The game's story follows Ramza Beoulve, a highborn cadet who finds himself thrust into the middle of an intricate military conflict known as The Lion War, where two opposing noble factions are coveting the throne of the kingdom. As the story progresses, Ramza and his allies discover a sinister plot behind the war. The game received extremely positive reviews from gaming magazines and websites and has become a cult classic since its release. It has been cited as one of the greatest video games of all time. A spin-off title, Final Fantasy Tactics Advance, was released for the Nintendo Game Boy Advance in 2003 and a sequel to that title, Final Fantasy Tactics A2: Grimoire of the Rift, was released in 2007 for the Nintendo DS. Various other games have also utilized the Ivalice setting, including Vagrant Story for the PlayStation and Final Fantasy XII for the PlayStation 2. An enhanced port of Final Fantasy Tactics, Final Fantasy Tactics: The War of the Lions, was released in 2007 as part of Square Enix's Ivalice Alliance project. An example of the isometric battlefields found in the game. The blue panels on the ground mark where the Wizard (with straw hat and "AT" icon) can move to. Another difference is the manner in which random battles are encountered. Like other Final Fantasy games, random battles occur on the world map. However, in Final Fantasy Tactics, random battles only occur in pre-set locations, marked in green on the world map. Passing over one of these spots may result in a random encounter. Another major aspect of battles is magical attacks. Certain magical attacks cause area of effect damage, and many of the more powerful magical attacks require several turns of charging. Hit Points of enemy units are also visible to the player (except in the case of certain bosses), allowing the player to know exactly how much damage they still have to inflict on a particular unit. Movement on the world map is limited to predefined paths connecting the towns and battle points. When the character icon is over a town, a menu can be opened with several options: "Bar" for taking sidequest job offers, "Shop" for buying supplies and equipment, and "Soldier Office" for recruiting new characters. Later in the game, some towns contain "Fur Shops" for obtaining items by way of poaching monsters. Final Fantasy Tactics offers a wide selection of Job Classes. This particular character is currently a Wizard. Like several installments in the series, Final Fantasy Tactics features a character class system, which allows players to customize characters into various roles. The game makes extensive use of most of the original character classes seen in earlier Final Fantasy games, including Summoners, Wizards (Black Mages), Priests (White Mages), Monks, Lancers (Dragoons), and Thieves. New recruits start out as either a Squire or a Chemist, the base classes for warrior and magician jobs, respectively. The game features twenty jobs accessible by normal characters. Throughout the game, unique characters also join the party. As well, some characters join as "guests", which are computer-controlled characters that fight on your side. Many of the unique characters have custom classes that replace the base squire class. It's also possible to recruit monsters into the party. Monsters have unique abilities, but cannot change jobs. Monsters can be captured from battles or bred from existing monsters. In battle, JP are rewarded for every successful action. JP are used to learn new abilities within each job class. Accumulating enough JP results in a job level up; new jobs are unlocked by attaining a certain level in the current job class (for instance, to become a Priest or Wizard, the unit must first attain Job Level 2 as a Chemist), which also allows the character to gain more JP in that class in battles. Once all the abilities of a job class have been learned, the class is "Mastered". A soldier in a specific Job always has its innate skill equipped (Wizards always have "Black Magic," Knights always have "Battle Skill") but a second job-skill slot and several other ability slots (Reaction, Support, and Movement) can be filled with any skill the particular soldier has learned from any job class. This deep level of customization and flexibility grants nigh-infinite replayability, contributing to the game's unusually enduring popularity. The story takes place in the kingdom of Ivalice, located in a peninsula surrounded by sea on the north, west and south, with a headland south of the landmass. Its geography features ranging landscapes, from plains to mountains ranges to deserts and forests. It is heavily populated by human beings, although intelligent monsters can be found living in less populated areas. Magic is predominant in the land, although ruins and artifacts indicated that past populace had relied on machinery, such as airships and robots. Ivalice is a kingdom of seven territories; Fovoham, Gallione, Limberry, Lionel, Zeltennia, the Holy Territory of Murond (Mullonde in later versions), and the Royal Capital of Lesalie (Lesalia in later versions), Ivalice's neighbors are the kingdom of Ordalia in the east and Romanda, a military nation to the north, across the Rhana Strait. While the three nations share common royal bloodlines, major wars have taken place between them. An influential religious institution known as the Glabados Church heads the dominant faith, centering around a religious figure known as Saint Ajora. The story takes place after Ivalice ended its war with the two nations in what is known as the Fifty Years War, and is facing economic problems and political strife. Adding to its problems is the recent death of the king, whose heir is only an infant. A regent is needed to rule in place of the prince, and the kingdom is split between Prince Goltana, represented by the Black Lion, and Prince Larg, symbolized by the White Lion. The conflict leads to what is known in the game as the Lion War. Behind this backdrop is a revelation by the game's historian Alazlam J. Durai, who seeks to reveal the story of an unknown character whose role in the Lion War was major but was covered up by the kingdom's church. The setting is based around this character, named by default as Ramza, and revolves around his early life and the future conflicts he faced while the events that changed the kingdom unfold. Central to the plot of the game are two main characters, Ramza Beoulve and Delita Heiral. The two characters are childhood friends, and while both are born of differing social classes; Ramza a noble and Delita a commoner, both disregarded this fact and grew up together believing in justice and honor, as taught by Ramza's father Barbaneth (called Balbanes in earlier version). However, as the story progresses, the two characters faced many conflicts that changed their viewpoint on life; Delita seeks to manipulate the upper class to achieve his dreams, while Ramza believes in justice and honor regardless of name and class. The game's plot is then portrayed through the eyes of Ramza Beoulve, who is the player character of the story. His exploits in the war introduced him to a number of characters; each with their own roles and agenda concerning the war and the fictional world, Ivalice, that they inhabit. The most prominent factions at the beginning of the story are those of Prince Goltana and Prince Larg, both are nobles seeking to obtain control of the throne by being the guardian to the monarch's young heir and were thus engaged in a war. The story progresses to include characters from the Glabados Church, which have been controlling Ivalice silently and engineering the war in question. As the game progresses, players are able to recruit generic player characters and customize them using the Job system of the Final Fantasy series. Several battles also feature "Guest" characters that are controlled via the game's A.I., which may be recruited later in the game according to the story proper. Aside from original characters, the developers have also incorporated cameo roles from other Square games. The characters were designed by Akihiko Yoshida, who was also in charge of the illustration and character designs of games such as Tactics Ogre, Final Fantasy Tactics Advance, Final Fantasy XII, and Vagrant Story. Final Fantasy Tactics begins with Ivalice just recovering from the Fifty Year War against Ordalia. The power vacuum caused by the death of its ruler, King Omdoria, soon sparks another conflict. Princess Ovelia and the younger Prince Orinas are both candidates to the throne, with the former supported by Prince Goltana of the Black Lion, and the latter by Queen Ruvelia and her brother, Prince Larg of the White Lion. This erupts into a full-scale war known as the "Lion War", with either side using whatever means possible to secure their place in the throne. This includes bearing an illegitimate child, killing other possible heirs, betrayal, assassination and false identities. Throughout the game, nobles regard commoners and peasants as animals, and many commoners try to take revenge on the nobles, who abandoned them after the war. Most joined the so-called Corpse Brigade (a.k.a. Death Corps) to fight against the nobles' soldiers, and many die in vain. Ramza, part of the noble Beoulve family of knights, and Delita, his childhood friend who was an ordinary commoner, are witnesses to this phenomenon. Events such as meeting an arrogant noble named Argath (a.k.a. Algus), as well as the negligent killing of Delita's sister Tietra (a.k.a. Teta) during an uprising, cause Delita and Ramza to abandon their ties to the nobility, both going separate ways. Ramza joins a mercenary group, led by Gafgarion, who protects Princess Ovelia from being hunted by both sides. Delita joins Prince Goltana's forces to rise up through the ranks and gain control over his own destiny. Ramza and Delita are reunited when Gafgarion attempts to take Ovelia to Prince Larg, though this proves futile. Agrias suggests visiting Cardinal Delacroix (a.k.a. Draclau) of the Glabados Church to protect Ovelia, while Delita continues to work in the shadows, working with multiple sides to realize his ambitions. Along the way to Lionel Castle, Ramza meets Mustadio, a machinist in possession of a holy relic called the Zodiac Stone. Hunted by a trading company for the power it contains, Mustadio also seeks Delacroix’s intervention. However, soon after the encounter with Cardinal Delacroix, Ramza discovers that an elaborate plot was set by the Glabados Church. In their desire to control Ivalice, the Church, particularly the High Confessor Marcel Funebris (a.k.a. High Priest Marge Funeral), uses the legend of the so-called holy Zodiac Braves to gather the Zodiac Stones, and fuels the Lion War between Larg and Goltana. To stave off Ramza's interference, Delacroix uses the stone to transform into a legendary Lucavi demon, and Ramza has no choice but to slay him/it. As a result, Ramza is regarded a heretic of the Church, and he is approached by the Confessor Zalmour (a.k.a. Heretic Examiner Zalmo) at Lesalia Imperial Capital. While noble in name, the Beoulve family is susceptible to corruption, due to ambition. Dycedarg, the eldest sibling, conspires with Larg and the Church to ensure that the Beoulve family remains in power. However, his younger brother Zalbag is unaware of his dealings. Alma, Ramza's younger sister, remains in church, unaffected by the situation until Ramza is branded a heretic in front of her. Ramza seeks to rescue her after her capture while helping Ramza escape the Confessors/Heresy Examiners. Only Ramza and Alma share their father's sense of justice. Ramza is chased throughout the story by the Knights Templar (a.k.a. Shrine Knights), the soldiers of the Church who are hunting the Zodiac Stones, although he gains allies, either by saving their lives, or by showing them the truth. Some individuals with knowledge of the Zodiac Stones attempt to conspire with the Knights Templar for its power, though most fail. Ramza also acquires proof of the Church's lies about Saint Ajora, a central figure in the religion, and attempts to use it along with the Zodiac Stone to reveal the organization's plot. During the course of the story, the two sides face off in a major battle that sees the deaths of many soldiers, including their leaders Larg and Goltana. Ramza manages to stop the bloodshed from continuing and rescues the general, Count Cidolfus Orlandeau (a.k.a. Cidolfas Orlandu), though the Church succeeds in eliminating the two Lions to secure its power over Ivalice. Deeper into the story, Ramza discovers that the Knights Templar are in reality possessed by the Lucavi, who are the real conspirators behind the Church's plot. The Lucavi are seeking to resurrect their leader Ultima (a.k.a. Altima), who in the past was Saint Ajora, and they need much bloodshed and a suitable body to complete the resurrection. Alma is to serve as the host for Ultima's incarnation. While racing off to find her, Ramza encounters Dycedarg - now a Lucavi demon - and witnesses Zalbag's death. Zalbag is then risen and converted into an undead servant, and frequently begs for death during the encounter. At the end of the story, though Ultima is resurrected, Ramza and his allies succeed in destroying her. Their final fates are unknown, although Orran Durai (a.k.a. Olan), a witness who had many encounters with Ramza, does witness Ramza and Alma riding away from the kingdom on Chocobos at the end of the game. In the epilogue, Delita marries Ovelia and becomes the King of Ivalice. However, he fails to find true satisfaction as even Ovelia distrusts him, leading her to stab Delita. Ovelia in turn is stabbed by the agonizing Delita and dies. Delita then sorrowfully cries out to Ramza, asking if what they have done was worth what they received (vilification for Ramza, and ostracization for Delita). Orran attempts to reveal the Church's evil plot with the "Durai Report." However, his papers are confiscated and he is burned at the stake for heresy. The story ends many centuries later with the historian Arazlam J. Durai (a.k.a. Alazlam) intent on revealing the truth of the Lion War and the Durai Report. Final Fantasy Tactics was produced mostly by the team that made Ogre Battle and Tactics Ogre, and was Yasumi Matsuno's first project with Square following his departure from Quest in 1995. In an interview with Akito Inoue, an assistant professor at the International University of Japan, Inoue mentions that Final Fantasy Tactics was made because of how casual gamers are usually put off by games with branching storylines found in other Matsuno's titles such as Tactics Ogre. Several historical and mythological references were altered by translators: for instance, the Norse World Tree, Yggdrasil, makes an appearance as Yugodorasil; the word "breath" is consistently rendered as "bracelet" in attack names; and Wiegraf's name is nearly homonymous with a character from Beowulf but rendered differently. The in-game tutorial function also shows examples of Engrish - poorly translated English - including lines such as "This was the darkened Items won't appear." The game also includes references to several Final Fantasy specific characters, places, and situations from earlier games in the Final Fantasy series — Final Fantasy VII's Cloud Strife is a playable character, and through the "Proposition" system in bars scattered around the world map, treasures and lost areas such as "Matoya Cave" (a reference to the first Final Fantasy) and various colors of materia can be found. To keep with tradition, Olan's adoptive father, Cidolfas Orlandu, is nicknamed "T.G. Cid", and chocobos are present in the game as well. Additionally, most of the monsters appear in one Final Fantasy game or another, although the Lucavi are entirely new monsters altogether. The original score for Final Fantasy Tactics was composed, arranged, and produced by Hitoshi Sakimoto and Masaharu Iwata. Matsuno approached his longtime friends Sakimoto and Iwata to compose the music soon after the initial release of Final Fantasy VII in January 1997. Sakimoto composed 47 tracks for the game, and Iwata was left to compose the other 24. The orchestral timbres of the game's music were synthesized, with performance by Katsutoshi Kashiwabara and sound programming by Hidenori Suzuki. The album was first released on two Compact Discs by now-defunct DigiCube on June 21, 1997, bearing the catalog number SSCX-10008, and was re-released by Square Enix on March 24, 2006, with the catalog number SQEX-10066/7. It spans two discs and 71 tracks, covering a duration of 2:31:03. Some reviewers made comparison with Nobuo Uematsu's Final Fantasy compositions, though the soundtrack received positive reviews from critics. Chudah's Corner summarized its review by stating that the soundtrack is an "astoundingly memorable classic of videogame music". This is also supported by other professional reviews, such as by an RPGFan reviewer that "don't believe that any other soundtrack known to man surpasses it", and a VGM World review who quotes that "the orchestral music is beautiful nonetheless". Final Fantasy Tactics sold nearly 825,000 copies in Japan in the first half of 1997, and ended the year at almost 1.24 million copies sold. Since then, the total number of copies sold in Japan has reached approximately 1.35 million. In the United States it reached an estimated sale of 750,000 units as of year 2004. As of March 31, 2003, the game had shipped 2.27 million copies worldwide, with 1.36 million of those copies being shipped in Japan and 910,000 abroad. Since its release, rumors were circulated that the game was to be re-released by Sony as a Greatest Hits title, the tentative date being around July 30, 2001. As of August, 2011, the game had sold over 2.4 million copies worldwide. Final Fantasy Tactics received universal acclaim upon its release, and critical opinion of the game has improved further over time. Magazines such as Electronic Gaming Monthly acknowledged it as "Square's first attempt into the strategy RPG genre"; though being "uneven", it is worthy of being called "a classic". Game Informer called it "the most impressive strategy RPG yet." Gaming websites such as GameSpot lauded the game's battle sequences as challenging, requiring more strategic planning than ordinary RPGs. IGN noted that the plot was the strength of the game, being in-depth and with numerous plot twists. During battle sequences, the story unfolds to create a serious atmosphere of the plot, even with simple and "cute" character design. The spells and summoning visuals were compared with Final Fantasy VII 's detailed graphics. Criticism is made on gameplay, plot and the localization effort. One of the reviews of RPGFan criticized the difficulty of the game as being inconsistent with each encounter against enemy units. The factors that influence the difficulty of the game include overpowered enemy units or party members, and time had to be taken to level up before any progress can be made. Though in-depth, IGN also noted that the game's plot was confusing at times, and that the item system was repetitive. The game's localization effort was criticized by reviewers as poorly written, being rife with grammatical mistakes that almost stopped players from enjoying the storyline. General RPGFan review noted that the battlefield area was too small, hindering any possibilities for better strategy. The gameplay is summarized by one of the reviews as "strength vs. strength and proper spacing of troops when fighting magic users". IGN awarded the game the Editor's Choice Award on 1998, praising the in-game graphics as "amazing" and the battle environments with its extra details as being "extremely well designed". GameSpot has named Final Fantasy Tactics as one of its Greatest Games of All Time—the first Final Fantasy game to receive such an honour. However, its legacy remains fairly obscure compared to Final Fantasy VII, also released for the PlayStation that year. The game still entered many "best games of all time" lists, receiving 84th place in the "Top 100 Favorite Games of All Time" poll by Japanese magazine Famitsu during March 2006, 19th in a 2005 list by GameFAQs users, 45th in Game Informer's list, 43rd in Electronic Gaming Monthly's, and 38th in IGN's. Since its release, Final Fantasy Tactics has attracted a cult following. Fan communities dedicated to modding and balancing the game have appeared on the internet. These communities experience member activity as of 2011, fourteen years after Final Fantasy Tactics' original release. Final Fantasy Tactics saw several re-releases. Final Fantasy Tactics was re-released as part of the Square's Millennium Collection. This series of games was only released in Japan, and each title is bought with a set of related merchandise. Final Fantasy Tactics was sold on June 29, 2000 along with titles such as Saga Frontier, Saga Frontier 2, Brave Fencer Musashi, Front Mission 3, Ehrgeiz and Legend of Mana. 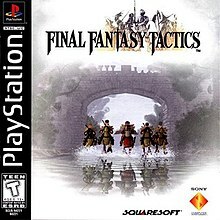 Four years after its release in 1997, Final Fantasy Tactics was selected as part of the Sony Greatest Hits line of rereleases. Games released as Sony Greatest Hits were sold at a lower price. Final Fantasy Tactics also became part of Ultimate Hits, Square Enix's main budget range available in Japan. A PlayStation Portable version of Final Fantasy Tactics, entitled Final Fantasy Tactics: The War of the Lions was released on May 10, 2007, in Japan; and is now released across all regions. It is the second game announced as part of the Ivalice Alliance. The game features an updated version of Final Fantasy Tactics, along with new features including in-game cutscenes, new characters, and multiplayer capability. The updated mechanics contain a 16:9 widescreen support, new items, new jobs, and cel-shaded full motion videos. The English version contains full voice acting during the cinematic cut scenes, whereas the Japanese version does not. The world of Final Fantasy Tactics has been featured in several other Square video games. After the game's release, the development staff went on to develop Vagrant Story, which featured several subtle references to Final Fantasy Tactics. In an interview with the French video game magazine Joypad, Matsuno stated that both titles are set in the same fictional world of Ivalice. During the development of Vagrant Story, Matsuno and Sakaguchi initiated a sequel to Tactics, which would have used 2D graphics due to issues with 3D development at the time. Due to the team's committent to Vagrant Story, the project was outsourced to an unspecified developer, but was cancelled for unspecified reasons. Square released Final Fantasy Tactics Advance for the Nintendo Game Boy Advance in 2003. The game setting and engine are similar to the ones of its predecessor, however the characters and plot are notably different; the cast of characters is considerably smaller, and the plot is considerably simpler. Additionally, Final Fantasy Tactics Advance has a shorter main campaign, but more side missions and a secret campaign at the end of the game. In 2006, Final Fantasy XII was released, also set in the world of Ivalice. Square Enix announced at the end of the same year the Ivalice Alliance, a new series of games set in the world of Ivalice, during a Tokyo press conference. The first title released was Final Fantasy XII: Revenant Wings. An indirect sequel to Final Fantasy Tactics Advance, titled Final Fantasy Tactics A2: Grimoire of the Rift, was released in Japan in 2007 and in the rest of the world in 2008. It is also one of the titles released under the Ivalice Alliance game series, and takes place in the Ivalice universe. Ramza also appears as a playable character in the fighting game Dissidia Final Fantasy NT. In 2017, the MMORPG Final Fantasy XIV: A Realm Reborn portrayed a version of the events of Final Fantasy Tactics as a fairy tale, with Ivalice being a mythical realm. It also introduced a version of Ramza and Alma as characters within the setting. The remixed song from the game, "Ovelia & Delita", was nominated for "Best Game Music Cover/Remix" at the 16th Annual Game Audio Network Guild Awards. ^ Japanese: ファイナルファンタジータクティクス, Hepburn: Fainaru Fantajī Takutikusu? ^ a b c d e Kasavin, Greg (1998-02-23). "Final Fantasy Tactics for PlayStation Review". GameSpot. Archived from the original on 2007-03-14. Retrieved 2007-04-24. ^ a b IGN Staff (2006-12-13). "IGN: Final Fantasy Tactics Returns". IGN. Archived from the original on 2007-03-06. Retrieved 2007-04-23. ^ a b c Square Electronic Arts, ed. (1997). Final Fantasy Tactics North American instruction manual. Square Electronic Arts. pp. 12–13. SCUS-94221. ^ a b Square Electronic Arts, ed. (1997). Final Fantasy Tactics North American instruction manual. Square Electronic Arts. pp. 10–11. SCUS-94221. ^ a b c d Square Electronic Arts, ed. (1997). Final Fantasy Tactics North American instruction manual. Square Electronic Arts. pp. 21–23. SCUS-94221. ^ Square Electronic Arts, ed. (1997). Final Fantasy Tactics North American instruction manual. Square Electronic Arts. p. 16. SCUS-94221. ^ a b c d e Square Electronic Arts, ed. (1997). Final Fantasy Tactics North American instruction manual. Square Electronic Arts. pp. 23–26. SCUS-94221. ^ Square (1997-06-20). Final Fantasy Tactics. PlayStation. Square Co.
^ Square (1997-06-20). Final Fantasy Tactics. PlayStatio. Square Co.
^ Gamespot Staff (2003-11-20). "Q&A: Final Fantasy XII developers". GameSpot. Archived from the original on 2007-03-10. Retrieved 2007-04-12. ^ "Final Fantasy Tactics: The War of the Lions ships to North American Retailers". Square Enix. 2007-10-09. Archived from the original on 2008-05-12. Retrieved 2007-12-13. ^ News:A war that caused terror for nearly 50 years between Ivalice and Ordalia, known as the "Fifty Year War". Square (1997-06-20). Final Fantasy Tactics. PlayStation. Square Co.
^ News: Goltana went to Lesalia and confined Ruvelia in Bethla for kidnapping the Princess, and let the Princess accede to the throne. Square (1997-06-20). Final Fantasy Tactics. PlayStation. Square Co.
^ Narrator: Many soldiers who returned from the war, had no jobs, little money, and even less loyalty to the crown. Square (June 20, 1997). Final Fantasy Tactics. PlayStation. Square Co.
^ Golagros: The Death Corps lost most of their men and now are surrounded by the Hokuten. Square (June 20, 1997). Final Fantasy Tactics. PlayStation. Square Co.
^ Argath: Heh! Commoners are all alike. You'll never be nobles! Delita, You don't belong here! Understand, rascal!? Square (June 20, 1997). Final Fantasy Tactics. PlayStation. Square Co.
^ Ramza: ...I'm no longer a Knight. Just a mercenary like you. / Gafgarion: ...That's right. Well then. Let's go! Square (June 20, 1997). Final Fantasy Tactics. PlayStation. Square Co.
^ Delita: You won't confuse me! Nobody uses me!! Square (1997-06-20). Final Fantasy Tactics. PlayStation. Square Co.
^ Delita: You and I are the same... Miserable people forced to live false lives. Always being used by someone... Try hard and you'll be rewarded they say. Lies... Only those close to the top are rewarded without trying, It's the way of the world. Most people have to act the roles given to them... Then again, most of them haven't even noticed they're even acting. No way I'd do that. I won't be used. I'll be the one using! Those who used me must pay for what they've done! Square (1997-06-20). Final Fantasy Tactics. PlayStation. Square Co.
^ Mustadio: I don't know what power the stone has... But Rudvich wants to use its power to make weapons. My father told me never to give the stones to him. So they abducted him. Square (1997-06-20). Final Fantasy Tactics. PlayStation. Square Co.
^ Ramza: Why do you think the Cardinal wanted the stone? People are sick of long wars and political in fighting. Draclau wants to use the 'Zodiac Brave Story'. Creating 'Zodiac Braves' by collecting holy stones, he can control the world. Square (1997-06-20). Final Fantasy Tactics. PlayStation. Square Co.
^ Simon: Simon: High Priest and his sect are trying to regain power. First, they're reducing Larg and Goltana's military power by causing in-fighting. If the war drags on, it not only reduce their power, but trust in the royal family. Square (June 20, 1997). Final Fantasy Tactics. PlayStation. Square Co.
^ Draclau: Ha, ha, ha... You're the one holding the stone. You can change not only the world, however the truth of everything with its power. Since you don't seem to understand, let me show you. Square (1997-06-20). Final Fantasy Tactics. PlayStation. Square Co.
^ Ramza: Why am I a 'heretic'? I haven't done anything. / Zalmo: Don't be coy! You killed Draclau and took the Holy Stone to give it to a demon! Square (1997-06-20). Final Fantasy Tactics. PlayStation. Square Co.
^ Dycedarg: If only you hadn't interfered... Ivalice would've been ours, the Beoulve's... You fools... Square (1997-06-20). Final Fantasy Tactics. PlayStation. Square Co.
^ Ramza: You should run, Alma! Or you too, will be branded a 'heretic'! Hurry and run!! / Alma: I can't leave you alone here! Square (June 20, 1997). Final Fantasy Tactics. PlayStation. Square Co.
^ Olan: Ramza, you're not alone! You have friends! Allies who'd risk their lives! I'm one of them! Square (1997-06-20). Final Fantasy Tactics. PlayStation. Square Co.
^ Meliadoul: I'm going to give you this Zodiac Stone. In return, let me go along. I want to know why my father... Besides... Square (June 20, 1997). Final Fantasy Tactics. PlayStation. Square Co.
^ Rudvich: Why him...? / Draclau: You failed enough. Now you must take responsibility... Square (1997-06-20). Final Fantasy Tactics. PlayStation. Square Co.
^ Barinten: Don't do anything funny! The odds are against you! / Vormav: Odds? What do you think you weak humans can do? Square (1997-06-20). Final Fantasy Tactics. PlayStation. Square Co.
^ Germonik Scriptures: "After Ajora's death, the church had to unite St. Ajora with God making him divine. To do that, unsuitable facts had to be deleted from history and St. Ajora had to become a 'Child of God'." Square (June 20, 1997). Final Fantasy Tactics. PlayStation. Square Co.
^ Ramza: The stones are evil...and so are the Zodiac Braves. The legends we believed in were all lies! Square (1997-06-20). Final Fantasy Tactics. PlayStation. Square Co.
^ Ramza: But collecting the stones and using the Brave Legend to use the people... / Malak: You mean even the High Priest's being used? Square (June 20, 1997). Final Fantasy Tactics. PlayStation. Square Co.
^ Vormav: No, it will work... It just needs more... You didn't hear? It just needs more blood... Lots of blood is needed for the Angel's resurrection. Much bloodshed since Ajora's death, but I guess it wasn't enough... I guess I'll have to go on another rampage...!! Heh, heh, heh.... Don't worry... I'll 'sacrifice' you first. Square (1997-06-20). Final Fantasy Tactics. PlayStation. Square Co.
^ Velius: Why, why is Virgo responding? You...can't be... Very nice! I didn't expect to meet you here! I thought it would take 100 years to find you! I never dreamed you were the one! Square (1997-06-20). Final Fantasy Tactics. PlayStation. Square Co.
^ Olan: Delita married Ovelia. A commoner brings peace to a chaotic kingdom, marries the Princess, becoming King. A legend that will be passed down for centuries. Delita may be a good person as you said... He made it look like he killed her then let her go, when her identity was clear. I guess he identified with her, having been used by Vormav... Square (1997-06-20). Final Fantasy Tactics. PlayStation. Square Co.
^ King Delita: "O... Ovelia...?" Queen Ovelia: "You use everybody like that! Now you'll kill me just like Ramza...!" King Delita: "Ramza... What did you get?" Square (June 20, 1997). Final Fantasy Tactics. PlayStation. Square Co.
^ Alazlam: But the church which feared public disclosure of the truth decided to arrest Durai and burn him at the stake for the crime of heresy. Square (June 20, 1997). Final Fantasy Tactics. PlayStation. Square Co.
^ Narrator: I am Alazlam, a scholar of ancient Ivalice history... Square (1997-06-20). Final Fantasy Tactics. PlayStation. Square Co.
^ Alazlam: But I have uncovered the truth... Let me now revive his honor. Let his way of life be absorbed by the next generation. Square (June 20, 1997). Final Fantasy Tactics. PlayStation. Square Co.
^ critiqueofgames.net staff (2004-03-19). "スクウェア・エニックス開発スタッフルーム". Critique of Games. Archived from the original on 2007-12-23. Retrieved 2007-12-11. ^ "Critique of Games: Akito Inoue". Square Haven. 2007-05-27. Archived from the original on 2007-12-18. Retrieved 2007-12-13. ^ "Engrish Slang". Language schools. 2007. Retrieved 2007-07-27. ^ IGN staff (1997-06-24). "Preview:Final Fantasy Tactics". IGN. Archived from the original on 2007-12-15. Retrieved 2007-12-13. ^ Hoyak, Paul. "Final Fantasy Tactics Original Soundtrack Review". VGM World. CocoeBiz L.L.C. Archived from the original on 2007-10-11. Retrieved 2007-12-20. ^ "Label: DigiCube - MusicBrainz". MusicBrainz. Archived from the original on 2008-05-16. Retrieved 2007-10-17. ^ Jormungand (1997). "Review by: Jormungand". Chudah's Corner. Archived from the original on 2012-01-24. Retrieved 2007-04-14. ^ Gann, Patrick (1997). "Final Fantasy Tactics Original Soundtrack Review". RPGfan. Archived from the original on 2013-01-16. Retrieved 2007-04-14. ^ Harry (2006-05-18). "Customer Review". VGM World. CocoeBiz L.L.C. Archived from the original on 2007-07-03. Retrieved 2007-04-14. ^ "Final Fantasy Tactics Review | Edge Online". Web.archive.org. 2013-05-21. Archived from the original on May 21, 2013. Retrieved 2016-03-11. ^ Chinn, Marty. "Famitsu Top 120 PlayStation games". Gaming Age. Archived from the original on 2011-06-05. Retrieved 2007-12-07. ^ "drizzt908's Final Fantasy Tactics Member Review for the PS". Gamerevolution.com. 2007-04-10. Archived from the original on 2016-03-12. Retrieved 2016-03-11. ^ a b c d "IGN staff" (1998-01-27). "Final Fantasy Tactics". IGN. Archived from the original on 2007-02-06. Retrieved 2007-04-24. ^ "Test du jeu Final Fantasy Tactics sur PS1". Jeuxvideo.com. 2010-07-06. Archived from the original on 2016-03-09. Retrieved 2016-03-11. ^ "Finals". Next Generation. No. 40. Imagine Media. April 1998. p. 96, 98. ^ a b "Final Fantasy Tactics for PlayStation". GameRankings. CBS Interactive. Archived from the original on 2018-02-06. Retrieved 2018-07-02. ^ "Final Fantasy Tactics". PSX Extreme. No. 7. March 1998. p. 31. ^ "Final Fantasy Tactics - Reader Review". Rpgamer.com. Archived from the original on 2016-03-12. Retrieved 2016-03-11. ^ a b Tortolia. "RPGFan Reviews". RPGFan. Archived from the original on 2007-10-11. Retrieved 2007-12-07. ^ a b "Esque" (1998-01-27). "Final Fantasy Tactics". RPGFan. Archived from the original on 2007-10-11. Retrieved 2007-12-08. ^ "RPGFan Reviews - Final Fantasy Tactics". Rpgfan.com. Archived from the original on 2011-06-23. Retrieved 2011-08-15. ^ Justin Boot (2009-02-06). "Final Fantasy Tactics - PSone review at Thunderbolt". Thunderboltgames.com. Archived from the original on 2016-03-12. Retrieved 2016-03-11. ^ a b "Final Fantasy Tactics for PlayStation Reviews". Metacritic. CBS Interactive. Archived from the original on 2010-11-25. Retrieved 2007-07-21. ^ Famitsu staff. "Weekly Famitsu 9/12". Weekly Famitsu (in Japanese). Archived from the original on 2009-02-22. Retrieved 2007-12-16. ^ "1997年ゲームソフト年間売上TOP100" [1997 Game Software Annual Sales Top 100]. Famitsū Gēmu Hakusho 1998 ファミ通ゲーム白書1998 [Famitsu Game Whitebook 1998] (in Japanese). Tokyo: Enterbrain. 1998. Archived from the original on 2015-06-28. ^ "Japan Platinum Game Chart". Magic Box. Archived from the original on 2007-12-13. Retrieved 2007-12-07. ^ "US Platinum Videogame Chart". Archived from the original on 2007-04-21. Retrieved 2007-12-07. ^ "February 2–4, 2004" (PDF). Square Enix. 2004-02-09. p. 27. Archived (PDF) from the original on 2012-02-13. Retrieved 2008-03-01. ^ Wollenschlaeger, Alex. "Final Fantasy Tactics not a Greatest Hits Title?". RPGamer. Archived from the original on 2008-07-19. Retrieved 2007-12-07. ^ Kanzaki, Sumire. "There's Something About Final Fantasy Tactics". RPGFan. Archived from the original on 2007-05-15. Retrieved 2007-12-07. ^ "FINAL FANTASY TACTICS: THE WAR OF THE LIONS NOW AVAILABLE ON iPhone/iPod touch!". Square Enix. Archived from the original on 2012-03-31. Retrieved 2011-08-28. ^ McNamara, Andy, ed. (1997). Game Informer Magazine. Sunrise Publications. ^ Kasavin, Greg (1997). "GameSpot: The Greatest Games of All Time: Final Fantasy Tactics". GameSpot. Archived from the original on 2012-11-03. Retrieved 2007-04-14. ^ Campbell, Colin (2006). "Japan Votes on All Time Top 100". Next Generation. Archived from the original on January 10, 2012. Retrieved 2006-03-12. ^ "Fall 2005: 10-Year Anniversary Contest—The 10 Best Games Ever". GameFAQs. Archived from the original on 2015-07-16. Retrieved 2007-09-23. ^ "Top 100 Games of All Time". Game Informer (100): 34. August 2001. ^ EGM staff (2001). "Electronic Gaming Monthly's 100 Best Games of All Time". Electronic Gaming Monthly. Gamers.com. Archived from the original on 2003-06-11. Retrieved 2006-11-17. ^ "IGN Top 100 Games 2007| 38 Final Fantasy Tactics". IGN. Archived from the original on 2007-11-29. Retrieved 2007-12-15. ^ Bracken, Mike (2003-10-01). "RPGFan Reviews - Final Fantasy Tactics Advance". RPGfan.com. Archived from the original on 2010-01-12. Retrieved 2010-02-16. Things changed over time, though-and [Final Fantasy Tactics] garnered a cult following not long after it disappeared from store shelves. ^ "Final Fantasy Hacktics". Final Fantasy Hacktics. Retrieved 2010-06-18. ^ IGN Staff (2000-04-10). "Square Announces the Millennium Collection". IGN. Archived from the original on 2007-10-20. Retrieved 2007-12-13. ^ Alder, Davon (2000-07-14). "Square Expands Millennium Collection". Square Haven. Archived from the original on 2007-12-19. Retrieved 2007-12-13. ^ Ahmed, Shahed (2001-07-19). "Final Fantasy Tactics rerelease this month". GameSpot. Archived from the original on 2007-09-03. Retrieved 2007-10-03. ^ Winkler, Chris (2006-04-28). "Square Enix Adds 16 to Ultimate Hits Series". RPGFan. Archived from the original on 2015-10-17. Retrieved 2007-05-31. ^ "Yasumi Matsuno Interview". Joypad magazine (in French). FFWorld.com. 2004. Archived from the original on 2007-10-11. Retrieved 2007-05-25. ^ "Des images du Final Fantasy Tactics 2 qui ne s'est jamais fait". Final Fantasy World. 2007-02-16. Archived from the original on 2018-05-20. Retrieved 2018-05-20. ^ Harris, Craig (2003-09-05). "IGN Final Fantasy Tactics Advance Review (page 2)". IGN. Archived from the original on 2007-02-16. Retrieved 2007-05-03. ^ "Square Enix announces FF Tactics for the PSP and Another New FFT Game". RPGFan. 2006-12-13. Archived from the original on 2012-02-23. Retrieved 2007-01-10. ^ Hatfield, Daemon (2007-09-20). "TGS 2007: Final Fantasy Tactics A2 Update". IGN. Archived from the original on 2007-10-11. Retrieved 2007-09-26. ^ Spencer (2007-10-25). "The marketing blitz of Final Fantasy Tactics A2". Siliconera. Archived from the original on 2007-12-28. Retrieved 2007-12-13. ^ "Here's A First Full Look At Ramza In Dissidia Final Fantasy". 29 January 2016. ^ "Final Fantasy XIV's next patch will seemingly tackle the world of Final Fantasy Tactics". destructoid.